Forgive the Instagram photo. I finished the last blocks for the queen size, wonky cross block quilt for my sister-in-law last night. This one is for a Christmas gift but I would like to get it finished before the Holidays get crazy. I also started the Remix quilt for my daughter that I mentioned in my last post. Halloween costume for my son. My daughter has requested to be Rapunzel and she already has a perfectly good dress already, so I just have one costume to make. Graduation quilt for my sister. She is graduating from high school early so I need to get started soon-ish. I am considering ditching my original plans and hopping on board with the spinning stars QAL. 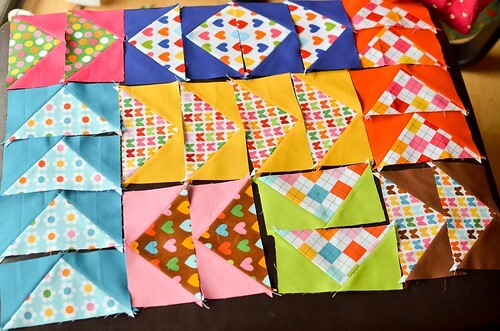 Love the wonky cross quilt--that one is on my very long to do list. And I'm glad I'm not the only thinking about Halloween costume already! Beautiful wonky cross quilt! I too don't like basting big quilts - I will have to come up with some kind of incentive program to help get it done! Your remix quilt will be so fun when it's done, can't wait to see. Nice geese. Love the prints. Those wonky crosses are great! Can't wait to see the finished quilt! love the wonky crosses and the remix! I love the wonky crosses. You should have no trouble finishing that before holiday craziness. How did I not know this blog existed????? YOU ROCK!! !